Hot Bagels & More has lifelong experience in quality food and customer service. Early in his career, Pete Lios was a bagel roller and baker in Brooklyn and North Jersey, where he learned to make authentic hand-rolled water bagels. 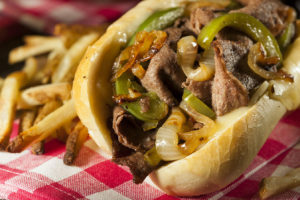 After Pete and his wife Marina Lios owned a hot food and coffee truck route in the Meadowlands area, had their three children Marianne, Markella, and Mark, and owned a successful luncheonette, they identified a lack of delicious freshly-made, hand-rolled bagels in the South Jersey area. Marina Lios’s food service background and organizational office experience ensured the success of the bagel business that started when they opened Hot Bagels & More in Somers Point in 1996. 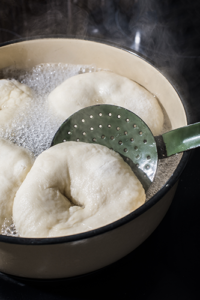 While the Lios’s expertise was monumental, people often say that the water in NJ makes the bagels so good; Hot Bagels believes the old-fashioned and no shortcuts process used makes them taste great. Our bagels contain fresh, non-artificial ingredients without any preservatives. This also means that they go stale in a few days and should be frozen in plastic to enjoy later. After a few years, and a lot of faithful returning customers, Hot Bagels’ name became well known in the South Jersey Shore area, even earning the “Best of the Press” award every year that bagels were rated! Everyone at Hot Bagels is very thankful and appreciative to the support from our customers who choose our bagels, share their experiences with their friends and family, vote for us time and again, and so much more. Without you, Hot Bagels wouldn’t have expanded to as many locations as it has or built the positive reputation for excellent bagels, cream cheese, customer service, and so much more. Hot Bagels has worked tirelessly to build a tasty bagel, while making every sacrifice to make their customers happy – a practice that continues into their 20th anniversary and beyond. Hot Bagels ambitiously opened the Margate store on Ventnor and Essex in 1997 after only a year of being in operation in Somers Point. The Tilton Road location opened in 2004, followed by the location on the corner of Ventnor Ave and Jefferson Ave in Margate in 2012. Finally, the Atlantic City location opened in 2014. 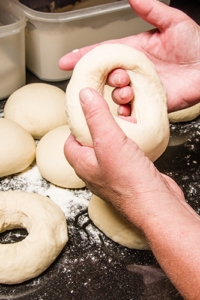 Hot Bagles And More has 5 locations on Absecon Island and surrounding areas. You can visit our Somers Point, Nothfield, Margate and Atlantic City stores to receive New York style fresh baked daily hand rolled water bagels, breakfast, lunch, daily specials, party platters, muffins and cookies, cold drinks, coffee and more! We are opened seven days per week. 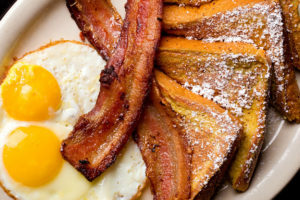 Hot Bagels and More has fresh bagels daily plus fresh, hot delicious coffee, breakfast, sandwiches and platters. Come visit one of our 5 locations near you.